Summer in the city: 7 things to do in Malaga you cannot miss! Malaga is the perfect starting point to get to know Spain. What’s more, it is the ideal South city to get closer to the Spanish culture. There is no better time than summer to explore all that Malaga can offer you, to smell the scent of subtropical plants that survive to the heat and sea breeze and to move to the rhythm of the city, which is waiting for you! In Malaga you will find it easy to get an idea of the Spanish history, because the city is brimming with tradition. Lose yourself in the authentically Spanish architecture and art of the city centre, scattered throughout all over the city. If you are not fond of agglomerations (yes, you must know Malaga is crowded in summer), you can always escape to any of the many small towns that surround the city and enjoy, even if it is just for a single day, Andalusian countryside lifestyle. Do you want to know what we recommend to you from our boutique hotel in the city? We have planned some things to do in Malaga that you will not able to resist! Let’s start this indispensable route through the city of the South with which you will fall in love from the minute one. 1) If you don’t go to a chiringuito (beach shack bar) and ask for the traditional espeto de sardinas (sardine skewer), you have not been to Malaga. But that’s not all… you must also savour a good plate of boquerones vitorianos (victorian anchovies), an indegenous species from the area of the bay of Rincón de la Victoria, a seaside town from the Axarquia region that claims to be the capital of the boquerón since this species (which is only fished here) is considered the best in the Peninsula. 2) Malaga markets are, without a doubt, a must-go. Atarazanas market is the ideal spot to contemplate the combination of 14th century Nazari architecture and 19th century iron architecture, while having a walk surrounded by the catch of the day: camarones (shrimp), pulpos (octopus), almejas (clams)… Try some of the most savoury delicatesen of Spain in a market that fuses history and tradition. It is just a few steps away from our hostel in the city centre of Malaga. 3) Among the culinary gems that offers Malaga, its world-renowded wines hold a privileged position. The vineyards of Malaga still use the old techniques, which preserve the full flavour of the grape. If you come to Malaga for a few days and you love the juice of the grape, try a wine tour and visit the most important wineries, so you can taste the product and experience first-hand how it is made. Where to go? Bodega Dimobe (Moclinejo), Bodega Jorge Ordóñez (Vélez-Málaga) or Bodegas Almijara (Cómpeta) are some of the names that you can write on your agenda. And what about the afternoon? 4) With a fully belly, everything looks diferent. It could be an excellent time to walk through the wonderful places that the centre offers within a walkable distance. You will not even need to take any transportation to visit any of the 34 museums that the city offers or some of its emblematic monuments of ancient history. 5) How about a one-day excursion to digest food? If you are interested in natural life and jaw-dropping landscapes, it is mandatory that you visit the town of Antequera and the Torcal. 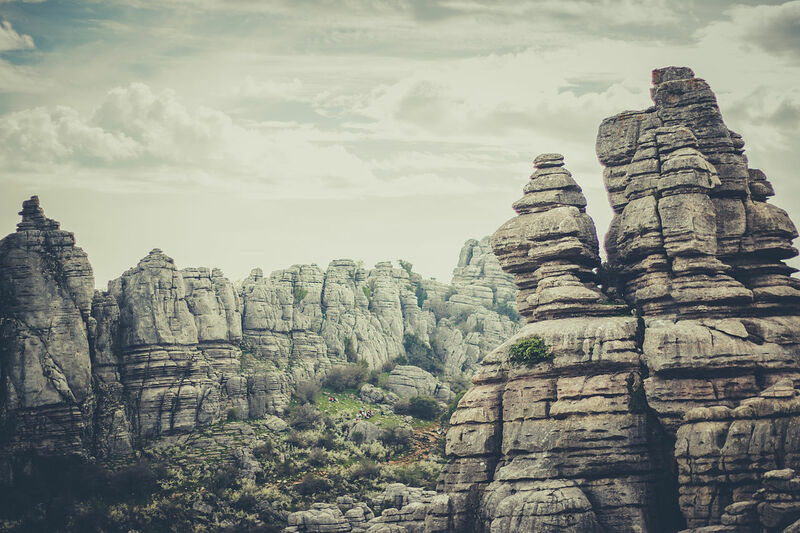 The natural reserve of the Sierra del Torcal is formed by limestone, which has been eroded over 150 million years to create a unique landscape composed by curiously shaped rocks. It is really worth a visit. 6) If moving so much is not in your plans and you prefer not to go so far from the centre, ¡go to the beach! But where? Try El Palo (literally ‘the stick’ in English) just 8 kilometers away from the city centre. It’s a traditional, authentic and fishing neighborhood of Malaga and one of the oldest districts in the city. Where does its name come from? The most widespread story tells that in 1908, at the stop of the tram that passed by this neighborhood, there was a really high and visible wooden stick. People began to identify this stop as the one with ‘the stick’, which ended up giving name to the neighborhood. El Palo is filled with chiringuitos where you can enjoy buen pescaíto, as for example El Tintero, a chiringuito where you don’t order your meal: you will see the waiters rushing from place to place while proclaiming the delicious dishes they carry straight from the kitchen, waiting for customers to request them at their tables. Ask for the one you like before it flies! 7) We have saved the best for last: the beautiful beaches of Malaga. If you really want to take your beach day to the next level, you may have to travel a bit… El Playazo de Maro, the beach of Almayate-Bajamar in Almayate or the Little, remote coves of Nerja are some of the places you cannot miss. Hidden Little oasis where you can escape, even for a day, from the buzz of the city of Malaga. Once you have recharged your batteries in one of these isolated paradises and immerse yourself in the sparkling and hectic leisure of the city, you can have a shower on our comfortable hostel and go out to enjoy the Malaga nightlife! Grab this little guide and take a tour around a city that will make you fall in love with its streets, its people and its culinary wonders. And if you come with your partner, don’t hesitate to take a look to the useful tips we offer for a perfect romantic getaway, so that you and your loved one can enjoy a summer designed for the two in the city of Malaga. And don’t forget that the staff of our boutique hotel is completely at your disposal for anything you need. Whether you are looking for directions or craving for good food, please, feel free to ask us. We will be glad to guide you in your stay in Malaga la bella! Visit our hostel booking section and do not worry about anything else because the only thing you’ll have to do is enjoy!